Where to buy Radon test kits? A2Z Radon sells home testing kits as well as offers professional in-home Radon testing services. Read below for more do-it-yourself testing options. In the State of Colorado, the state website www.colorado.gov has an entire section for Radon testing as well as Radon mitigation. For ordering a “do-it-yourself” home test kit, the website offers a link to the Kansas State University National Radon Program Services page which offers short-term test kits as well as long-term test kits. Costs range from $15.00 - $25.00 for the long term test kit. Both kits include everything that is needed including the final test. You can purchase short-term and long-term Radon test kits from the Kansas State University National Radon Program Services here. The only problem with the Radon test kits sold by the Kansas State University is that the tests are one time tests. There are other testing solutions available online or through your local home improvement store or hardware stores. A quick search online for “Radon detector” brings up several different results for short-term and long-term Radon detectors. The test you choose is going to really depend on the application of the test of course. The Radon detectors that continuously monitor and test are going to be more expensive than the one test solutions. 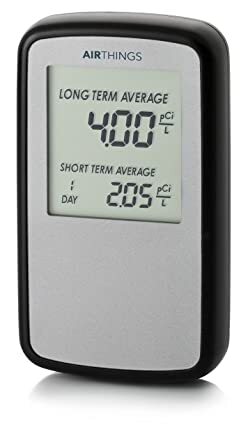 Purchasing a couple of the cheaper Radon testing solutions is probably one of the most practical solutions as opposed to investing into a more expensive solution like the “Air Things Radon Gas monitor”. Available at most major retailers, the Air Things Radon Gas monitor continuously tests the area for a long-term and short-term average. Perhaps one of the most accurate and dependable Radon tests on the market, the system averages $160 - $180 per unit which is more than five times the cost of other home test kits. The biggest difference between this test kit and others is going to be the fact that you will not have to purchase another Radon test kit for at least 5 years with the AirThingsRadon Gas Monitor. From professional to “do-it-yourself” novice home test kits, there are several hundred different solutions to choose from. For most home owners wanting to test themselves, perhaps the long and short term tests available from the Kansas State University are the best place to start. Of course there is always your local Radon mitigation professional as well. Most Radon tests performed by professional Radon mitigation experts are going to be similar in cost to performing the test yourself the biggest difference is going to be the way the test is performed. A Radon mitigation professional has significantly more experience in performing the test without making mistakes or errors. Regardless, the Radon test can be performed for a very small investment. In the State of Colorado there is financial assistance available for low income households. LIRMA (Low Income Radon Mitigation Assistance) Program will provide financial assistance to low-income households. The requirements for approval for this program can be seen here. The program will assist with up to $1,500 for a complete system if there is not currently a radon mitigation system in place. Along with financial assistance from the State of Colorado, there is a list of other federally funded or municipal funded programs available as well. A2Z Radon also sells Radon testing kits. If you would like information on our testing kits, simply fill out the form to the right and one of our staff will follow up with you the same business day. What is the difference between the packages above anyway? A "Complete Test Kit" would include both the short-term testing kit as well as the long-term testing kit. The Professional test would include a technician testing on-site. Channel 4 CBS Denver completed an entire segment about the dangers of Radon.